Last week when I posted Pineapple Pointers, I said I'd share a recipe that is delicious with fresh pineapple. Although pineapple is often paired with pork -- baked ham with pineapple rings, maraschino cherries and a brown sugar glaze comes to mind -- it's also tasty with tuna. Until I was a teenager, my favorite meal was a casserole my mother made called Chinese Casserole. I'm not sure how the dish got its name because, other than using soy sauce and rice, there's nothing Chinese about it. Chinese Casserole is made with everyday ingredients, ready to eat in a little over 30 minutes and, unlike some quick to prepare meals, full of flavor. The recipe uses what is known in Cajun and Creole cuisine as the "holy trinity:" onion, celery and green pepper. It's a real time saver to chop and measure the vegetables ahead of time. Store the vegetables together in an airtight container in the refrigerator. When it's time to cook, the time consuming prep work will already be done. All the ingredients will eventually be combined so use a large 10 or 12-inch skillet. Saute the onion, celery and bell pepper in a little margarine. 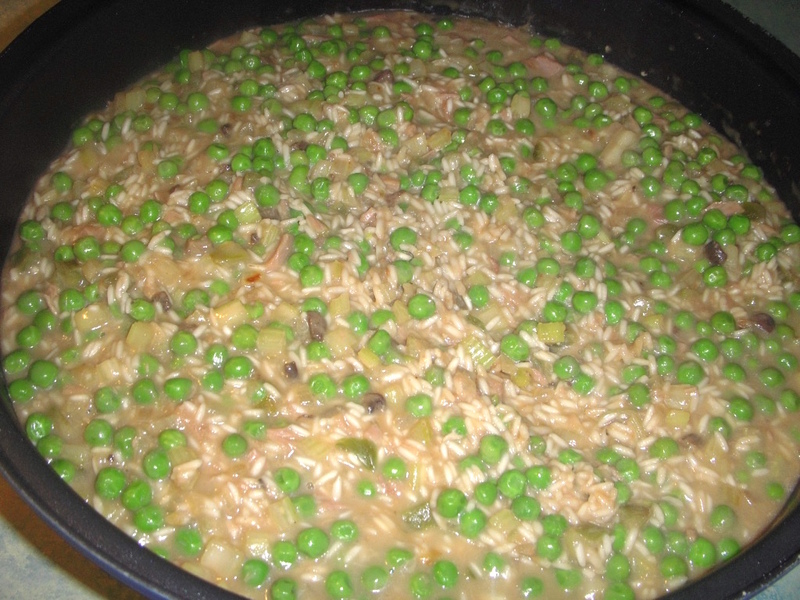 Once they're tender, stir the uncooked rice and sauteed vegetables together. Add the remaining ingredients. One of the ingredients is a 10 ounce package of frozen green peas. I can't find that size package anymore so I add about half of a 12 ounce package. I would add more, but my husband doesn't like green peas. The extra two ounces won't affect the recipe so you can add the entire package or reduce the amount of green peas to suit your taste. Bring the mixture to a boil, stirring constantly to prevent the rice from sticking. The easiest way I've found to loosen stuck on rice is with a metal spatula. Turn the spatula upside down in the skillet and push the rice away from you. The rice should come right up. If the rice sticks no matter how much you stir, turn the heat down to medium. Let the mixture boil for 10 minutes while you continue to stir. The rice starts cooking which reduces the amount of time the dish has to be baked. Pour the mixture into a greased 2-quart casserole dish and bake at 350° for 20 minutes. The casserole after it's boiled 10 minutes. The casserole is delicious served with fresh pineapple, but you can substitute canned pineapple chunks or rings. Put some garlic bread in the oven at the same time as the casserole and you've got dinner in a dash. 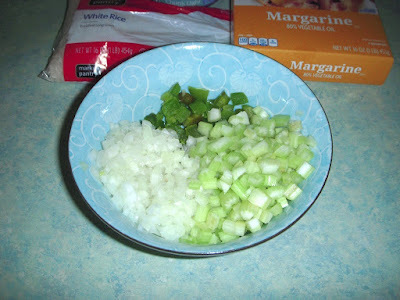 Saute the onion, celery and green pepper in margarine until tender. 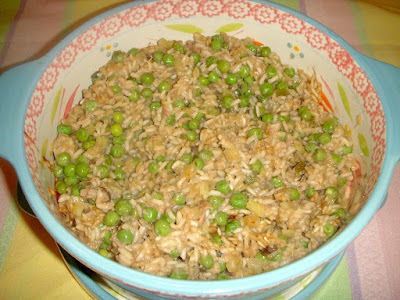 Stir the rice into the vegetables until thoroughly combined. Stir in the remaining ingredients. Bring the mixture to a boil and boil for 10 minutes, stirring constantly. Transfer the mixture to a greased 2-quart casserole. Bake at 350° for 20 minutes.